Trace flag 8721 is of interest to me when investigating ETL behavior. A complex ETL could change stats numerous times for lots of stats keys. Information for auto stats updates in addition to stats updates performed explicitly by ETL code can really help complete the picture of what happens during an investigation. I found this post from Prince Rastogi where he walks through a demo of trace flag 8721 by creating a new table with a stats key, increasing the rows from 0 to 1, then executing a query that requests the stats. Here's an important note: use trace flag 3605 (redirect some output to SQL Server log) together with trace flag 8721. I had two questions, and answered them both by following the same process. My first question: Does it still work in SQL Server 2016? Yep. Second question: Does it capture both async & sync auto stats updates? Yep. Snippet from the SQL Server error log below. 06/24/2016 12:16:11,spid57,Unknown,The error log has been reinitialized. See the previous log for older entries. 06/24/2016 12:16:11,spid57,Unknown,The service account is 'NT Service\MSSQLSERVER'. This is an informational message; no user action is required. 06/24/2016 12:16:11,spid57,Unknown,Logging SQL Server messages in file 'M:\MSSQL\Log\ERRORLOG'. 06/24/2016 12:16:11,spid57,Unknown,Authentication mode is MIXED. 06/24/2016 12:16:11,spid57,Unknown,System Manufacturer: 'VMware<c/> Inc.'<c/> System Model: 'VMware Virtual Platform'. 06/24/2016 12:16:11,spid57,Unknown,Server process ID is 1488. 06/24/2016 12:16:11,spid57,Unknown,Attempting to cycle error log. This is an informational message only; no user action is required. 06/24/2016 12:15:52,spid57,Unknown,Setting database option AUTO_UPDATE_STATISTICS_ASYNC to ON for database 'SEASIDE'. 06/24/2016 12:12:50,spid57,Unknown,The error log has been reinitialized. See the previous log for older entries. 06/24/2016 12:12:50,spid57,Unknown,The service account is 'NT Service\MSSQLSERVER'. This is an informational message; no user action is required. 06/24/2016 12:12:50,spid57,Unknown,Logging SQL Server messages in file 'M:\MSSQL\Log\ERRORLOG'. 06/24/2016 12:12:50,spid57,Unknown,Authentication mode is MIXED. 06/24/2016 12:12:50,spid57,Unknown,System Manufacturer: 'VMware<c/> Inc.'<c/> System Model: 'VMware Virtual Platform'. 06/24/2016 12:12:50,spid57,Unknown,Server process ID is 1488. So this happened today during an ETL. So the server had plenty of free RAM. But NUMA node 1 was in a pinch. And SSIS spooled its buffers to disk. Doggone it. I guess I'd figured that notifications were sent based on server-wide memory state. But I guess maybe memory state on each NUMA node can lead to a memory notification? I dunno though. This is SQL Server 2014 SP1 CU2. 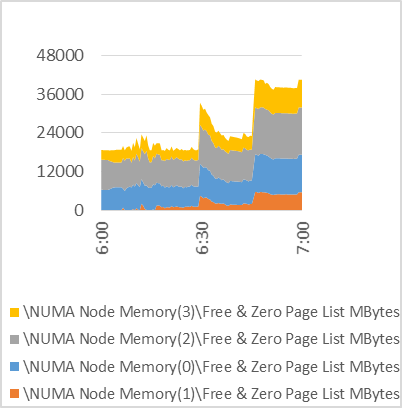 Memory is already being consumed unevenly across the NUMA nodes. 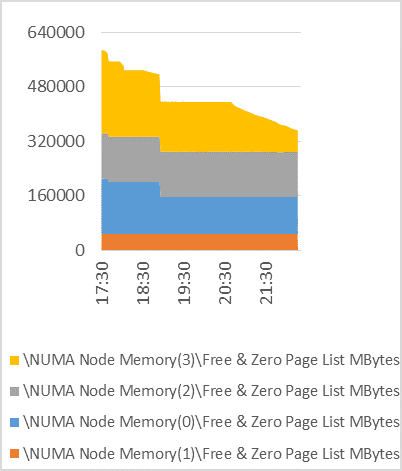 If NUMA node 1 gets short end of the stick by 6:00 am tomorrow, I think for now we may try to affinitize SSIS to NUMA node 2, in hopes that its memory allocations will come from that node and it that memory allocations will continue to allow enough free memory there even while short-changing NUMA node 1. 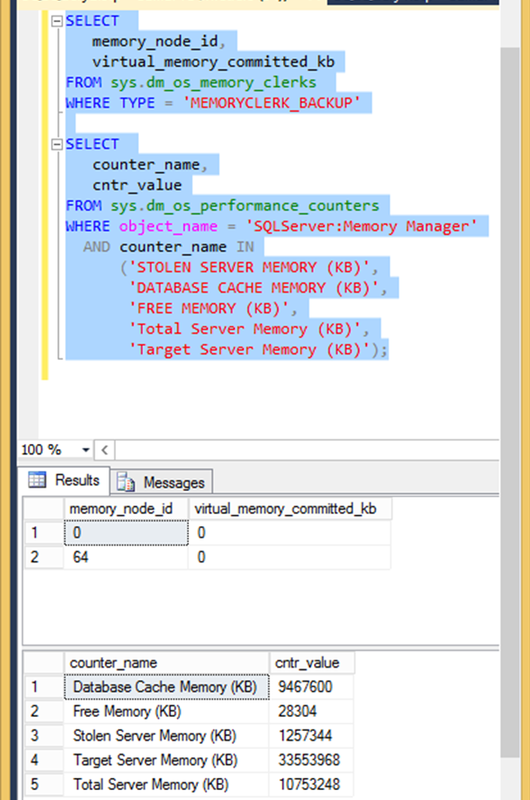 A blog post showing use of Windows Resource Manager to affinitize SSIS. But... this feature was deprecated in Windows Server 2012 R2. L'esprit de L'escalier - Whither SQL Server Backup Buffers? Sometimes the questions come to me as a form of L'esprit de L'escalier - not something I wish I'd said but a question I wish I had asked. So it is with my question: "Whither SQL Server Backup Buffers?" 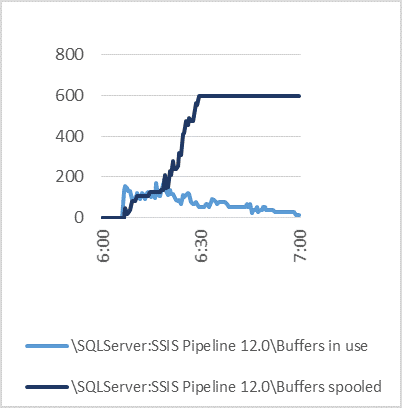 Yesterday (or maybe really early this morning) I posed the question: "Whence SQL Server Backup Buffers?" Here's what I noticed: 'Target server memory' 33553968 hadn't been achieved. 'Total server memory' during the backup was 14947794. Of that 4194496 was allocated to memoryclerk_backup. When the backup was cancelled, the memoryclerk_backup allocation was simply returned to the OS. Why not give it to free memory? It should have been nice, contiguous chunks of memory addresses. The server was far from reaching target server memory. The server wasn't under memory pressure. This is what it looks like right now... and it would have looked nearly the same right after the backup was cancelled. That's a lot of free memory. Take away 4 GB from it for the backup buffers... yeah, its still a lot of free memory. -If 'max server memory' wasn't being overridden by a more reasonable target (because max server memory is 120 GB on a 32GB VM), would the behavior still be the same before reaching target? I bet it would be. -What other allocations are returned directly to the OS rather than given back to the memory manager to add to free memory? I bet CLR does this, too. Really large query plans? Nah, I bet they go back into the memory manager's free memory. -Does this make a big deal? I bet it could. Especially if a system is prone to develop persistent foreign memory among its NUMA nodes. In most cases, it probably wouldn't matter. Maybe I'll get around to testing some of this. But it probably won't be for a while. Whence SQL Server Backup Buffers? Recently I saw a question on Twitter #sqlhelp about backup buffers, asking if they came from the bpool or MTL. Now about the idea of "coming from the buffer pool." 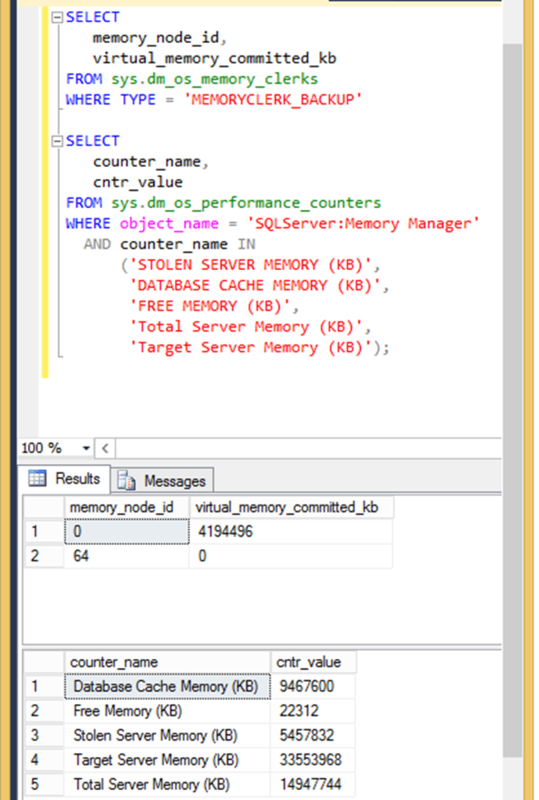 SQL Server still uses the term "stolen memory" to describe behavior and within its memory accounting. But in SQL Server 2012 and beyond, the bpool is a consumer of memory from the memory manager in much the same way as others. So although the bpool may shrink in order that another consumer can grow, that's a process managed by the memory manager. And the bpool is usually on the "need to shrink" side only because it tends to be one of the largest, if not the largest, consumers. "Are backup buffers governed by 'max server memory', or should I plan for backup buffers outside of 'max server memory' like we still do for SQL Server worker threadstacks?" Let's see what can be learned with a quick little experiment. Only if you have exclusive access to the memory resources on the server AND if a significant read load on the storage won't disrupt anyone. What will happen if I run a backup to DISK='NUL' on a very large database with buffercount = 1024 and maxtransfersize = 4194304 (4 mb)? Altogether, that should be 4 GB of memory allocation - should be quite noticeable. I'm testing on SQL Server 2016 RC2. Here's how things looked before the backup. Kinda boring. Memoryclerk_backup has nothing in node 0 or node 64. 'Total Server Memory (KB)' is just a hair over 10GB, even though 'Target Server Memory (KB)' is just shy of 32 GB. 'Max server memory' is actually 120000 MB. There hasn't been much happening in this instance for a few days. Lets fire up a backup. The test database is several terabytes, but in this case I'm writing the backup to NUL and I'll cancel the backup as soon as I learn what I want to know. How do the backup memory clerks and performance counters look now? Memoryclerk_backup on node 0 now has just over 4 GB allocated to it. Total server memory has increased by... let's see... 14947744 KB - 10753248 KB = 4194496 KB. That's exactly the size of the allocation to the backup clerk. Remember - the memory isn't really stolen from the buffer pool necessarily. Notice that 'Database Cache Memory (KB)' is the same 9467600 KB before and during the backup. 'Free Memory (KB)' has declined by 28304 KB - 22312 KB = 5992 KB. Doesn't that number look suspicious? So some memory really was stolen. But it wasn't stolen from the bpool, which remained the same size during the backup (until I canceled it) as it was before the backup. The additional stolen memory came from the free memory. Now, because target memory in this SQL Server instance is so much lower than 'max server memory' (my VM got shrunk from 128GB RAM to 32 GB RAM and I never adjusted 'max server memory'), I can't say that I proved that backup buffers will always be from within the allocation governed by 'max server memory'. Can I say it's left as an exercise for the reader?